Coming to Bac Lieu, the land with countless tales about the lavish White Prince (Bạch Công Tử), the birthplace of the Southern style folk singing, the hometown of the famous composer Cao Van Lau and his famous work “Dạ cổ hoài lang” (Night Drum Beats Causes Longing for Absent Husband), you will also have the chance to taste some of the best food in the South. Cuisines which are simple yet have mesmerized countless of tourists who came to this Southern land. From the original sesarmid, the chef can make so many dishes. The simplest is salty sesarmid. Only needed to be cleaned, shredded, mixed with sugar, chili, garlic, salt, and lemon, the strong in flavor sesarmid can now be served with white rice. 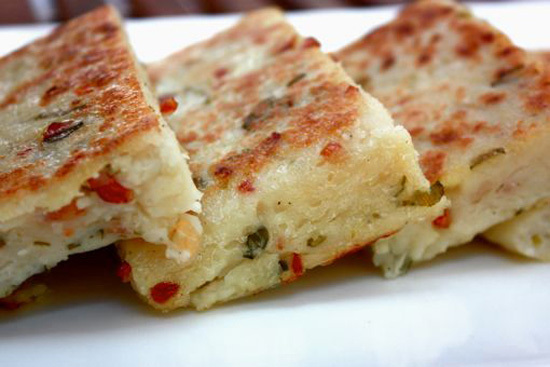 Visiting Bac Lieu, you should definitely stop by at some marketplace and try out this peculiar radish pie. Simple, yet elegant and bold, the pie is a perfect combination of puree flour and radishes as stuffing, suitable for many. The crust is made of flour mixed with grinded white radish flour. 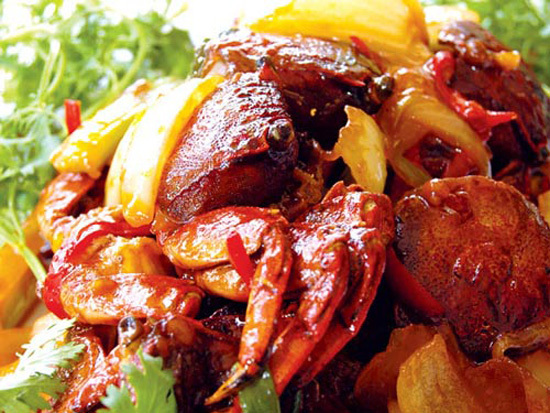 The stuffing is made of fried dried shrimp, marinated with some ingredients. Everything is now stuffed into the crust, and rolled in, and then baked. When eating, you should add in the green onion and oil mixture, addition with some herbs, lettuce. The pie has the smell of the flour, the bold flavor of the radish, the sweet of the shrimp, and the sour and salty of the fish sauce. The pie is great for brunch or teatime. Coming to Bac Lieu, the birthplace of the folk singing, you will have the chance to try the best “Bánh tằm” in the country. 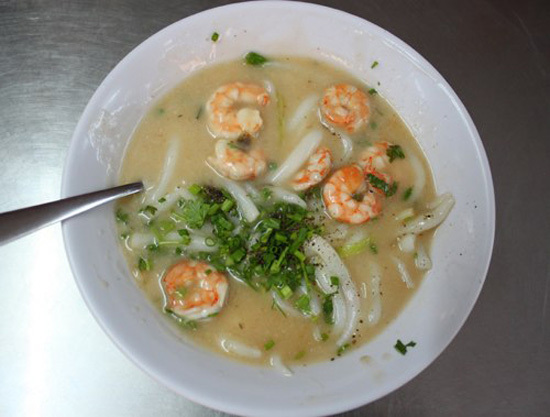 In the small town of Ngan Dừa, the noodle making business has become the backbone of the town. The noodle is a symbol of the simple, modest, yet abundant and generous Bac Lieu. The Ngan Dua Thick Noodles is soft, chewy, fat and sweet. There are two types of thick noodle: salty or sweet. Depending on your reference, each offers an equally wonderful experience. “Bánh tằm” is a delightful cuisine that is worth to try once in your life. 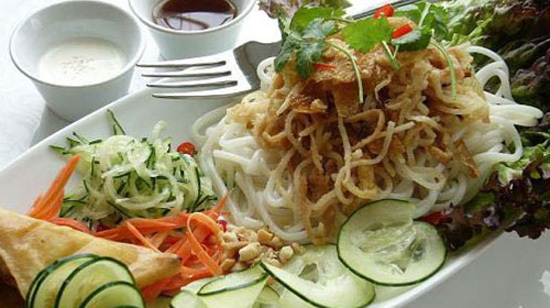 A Vietnamese dish that will make you cannot stop eating; the thick noodle’s most important ingredients are the coconut milk, fish sauce and lettuce. If you don’t like fat, you can reduce the amount of coconut milk. 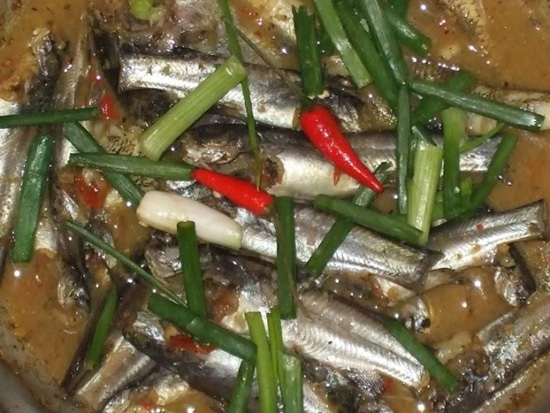 The fish sauce, which is indispensible, has to be sour, sour, salty, spicy, and sweet at the same time. You can add in some slices of chili if the level is not enough for you. Herbs are also important. Some leaves of lettuce, basil, and slices of cucumber will do. In the South, they don’t say “make” the pancakes, but “pour” it. When you pour, take a cup of flour pouring into the hot frying pan, to hear a sound “XEO”. The name of the pancake is based on the sound it made: bánh xèo (bánh is cake, xeo is the sound). The sound is unforgettable, and the flavor is irresistible, the pancake and its sauce will mesmerize you from the first taste. The sauce is also unique. The pancake is served along with some vegetables like lettuce, broccoli, and other herbs. You must use your hands to eat it, not chopsticks. The stuffing of the cake is made of shrimp, sliced onions, peas, and some radishes will make sit down and eager to eat. 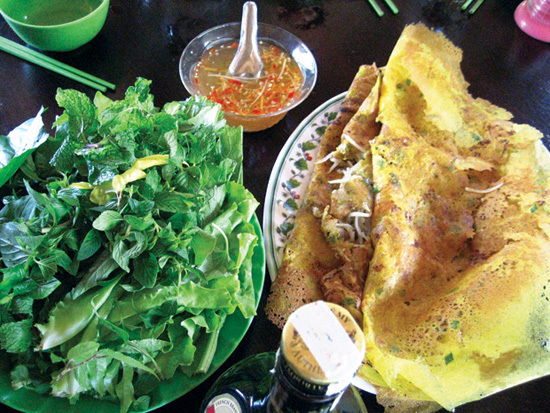 The Giồng Nhãn pancake requires nearly 20 types of herbs. Some can be easily found at the marketplace like cashew sprouts, young mango sprouts, Java plum (cóc) sprouts, perilla… and many more. These herbs will make the dish even more interesting and also good for the health. The crunchy hot and fat pancake combines with the ultimate fish sauce and the sweetness of shrimps will make you remember forever. No one exactly knows when the pickles were made, but with the Chinese community, they have used these in their daily meal for a very long time. 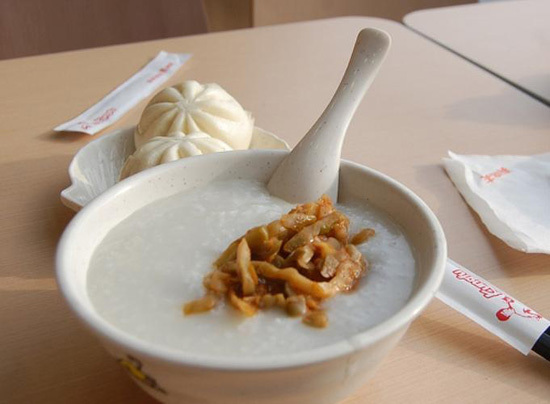 This is one of the most important cuisines in Chinese culinary culture. In order to make “Cốn xại”, you have to buy the freshest lettuce, cut into small pieces or leave it like original, dry until it is dried. After drying the lettuce, you mix it with salt, sugar, and wine. From salting to eating, it takes about two weeks to be ready. With “Xá bấu”, it is simpler to make. 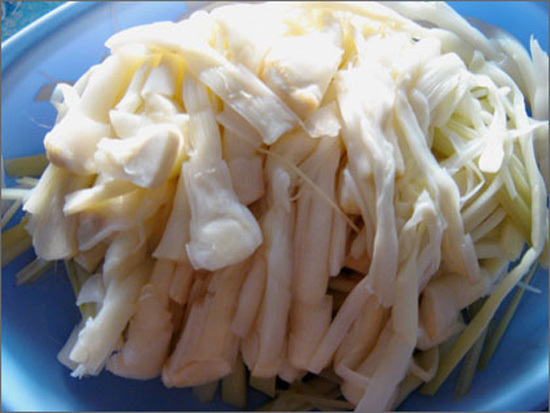 After buy the “Xá bấu”, all you need to do is to clean, then chop into slices and dry everything. When marinating, you add in sugar, salt and wine. When the sugar disappears, the dish is ready. The dishes have a distinguish flavors: sour and sweet, and very strong. Not only good with porridge, the pickles are also good to eat with fried stick rice cake (bánh tét chiên), shrimp crackers (bánh phồng tôm), dried fish, dried pork… It is also suitable to make salad with sliced bacon, shrimp, and fish sauce. The fat and crunchy larva season starts from October to February (Lunar). The full-grown larva usually has wings, and the wings are very hard that can dig in to wood and lay eggs. From the eggs become larvas, fat and sweet, which is dubbed by the people as the “finest of the South”. Like the close relative, the coconut larvas, there are many ways to cook them. 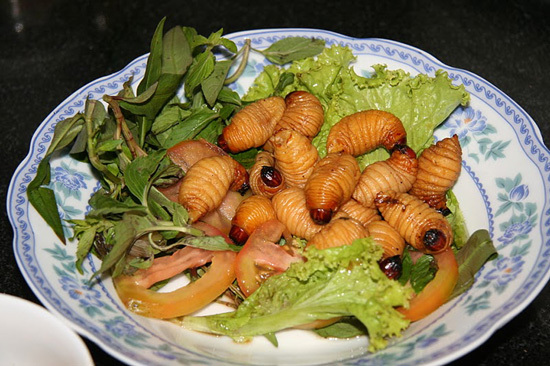 The best way to do is butter fried floured larva (đuông chà là lăn bột chiên bơ). The dip is usually soybean or fish sauce with garlic and chili. The fat of the larva, crunchy of the fried flour and the distinguish smell of butter and the sauce are just truly amazing. The sauce is bold in flavor, and has the color light blue. The fishes are usually intact, but their bones are all soft. The sauce is best to eat with guava, star fruit, bitter banana, tamarind, and a few slices of cucumber. To increase the flavor, you should feel free to have a bite of killer chili, which is green and terribly spicy. Dropping a bit of the fish into the mouth, you add into the bowl of flavors another bite of chili, instantly you will notice the sour combines with the spicy which are just wonderful. 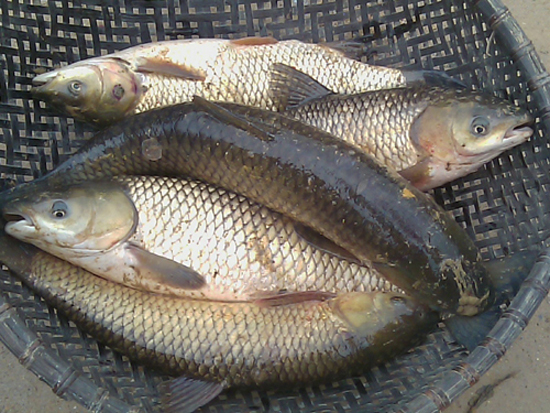 October to November is the time of the year to harvest the grass carp. The fish is fat, tasty, usually weighted about 1kg which is usually bought to make sauce. The sauce’s quality depends on the fat from the fish skin. After washing the fish with salt water, you don’t have to wait for it to dry of water, just marinate it with salt, put everything into a barrel, seal for three months. Before eating, you should do one more fry with honey. There are many ways to make Grass carp sauce. One special sauce is the distillated fish sauce. 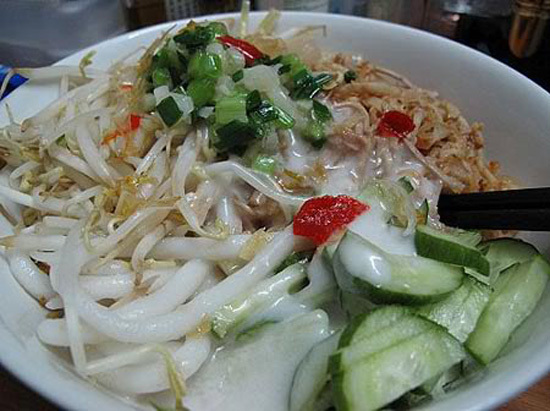 The dish is made of sliced fish, oil, chopped green onion, and cooked with eggs, chopped pork, and eaten with raw papaya. 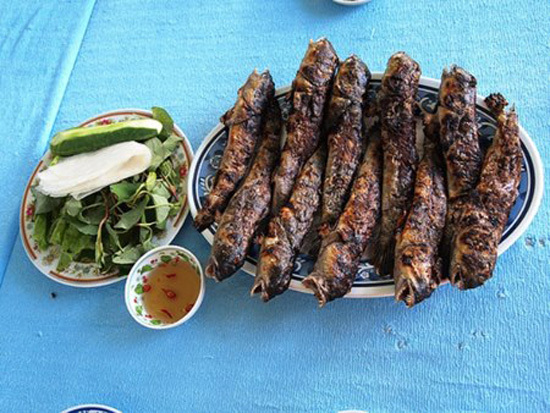 You can find the dwarf catfish in almost any place in the Mekong Delta, but the best place to eat is Bac Lieu City. During the raining season, the fishes are fat and their bellies are full of eggs. It is also the time to catch some and make the famous braised striped dwarf catfish with lemongrass and chili (cá chốt kho sả ớt). This is a very easy dish to make. The fish is fat and sweet, but doesn’t stink, and the eggs combined with the lemongrass and chili is truly delightful. The fish is eaten with endive, “bồn bồn”. The sourness of the latter will alter the flavor of the fish dramatically in the good way. 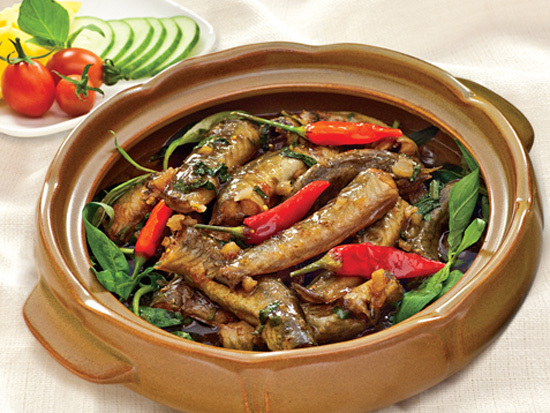 The land of Bac Lieu also has a very unique dish: the giant mudskipper. The fish has the width of a toe, and the looks, the shape and the skin of the fish are not very pleasant, yet the meat is very tasty. The locals like to grill the fish directly on the fire, which is simple and tasty. There are many ways to cook the dish. You can braise, make sour soup, which are the most common dish of the locals’ daily meals. Bac Lieu has many canals and small trenches, with a lot of mangroves which are suitable for the Pseudapocryptes speicie. During the Lunar October, followed the rising water, the fishes appear. The best part of the fish is the liver, which is fat and bitter. The fish is a type of gobies, so when making it, the chef won’t have to remove the fins and the skin, only need to chop it into smaller pieces. Dropping the meat into the boiling water, you can marinate the fish with salt or fish sauce, and add in green onion, and you have the delicious dish of “cá kèo”. Eating the fish, you will feel the sweet of the meat, the fat and the bitter of the liver, all are combined and all are delicious. 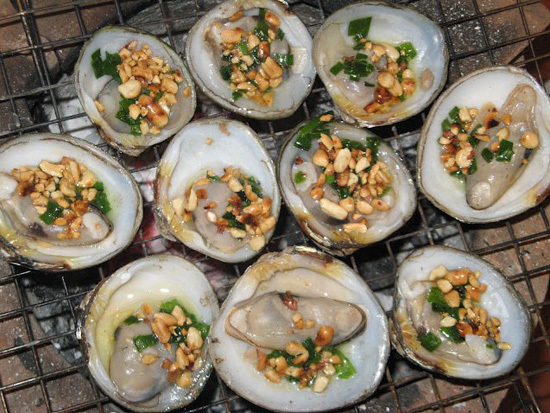 Grilled geloina coaxans is a very simple, with a bit of wild, yet amazingly delicious dish of the fishermen in Bac Lieu. Because it is a type of clam, miles of mangroves forest is a perfect place for the seashell to inhabit. After catching the coaxans, the cook will pin their heads into the ground, then he or she will cover the seashells with straw or dried wood. When the coaxans are cooked and because that their heads are pinned to the ground which retain the water inside, they cannot open the shells. Removing the ash outside, extracting the water and the meat inside, you will easily detect the sweet of the water. Dipping the meat into salt-n-pepper lemon sauce, you won’t be able to resist the urge for more. Not only grilled, the coaxans can be made into many more dishes: cooked with rice, boiled with ginger, braised with lemongrass, banana salad, but the best is to roast with green onion oil. The hot pot is made of many types of fishes. The broth is made of fresh coconut milk with lemongrass, fried garlic, with some slices of bacon. Depends on your taste and belly size, you can order more snakehead, Basa, catfish, or Pseudapocryptes. The vegetable is also the key to a perfect hot pot. You will need parsley, spinach, eggplants, lotus, broccoli, hyacinth… In the flooding season, there is also sesban which will make the dish even better. 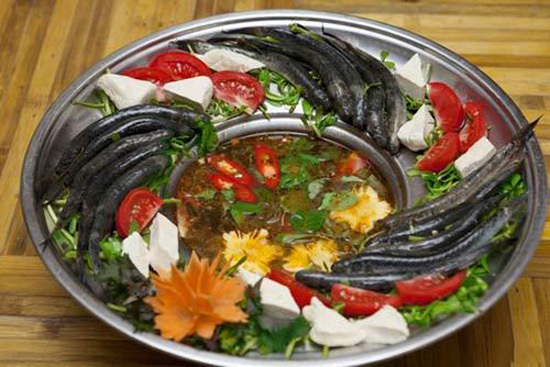 Fish hot pot has a sweet fragrance, tasty and can go with rice or rice vermicelli. The Spicy Beef rice vermicelli in Bac Lieu only needs beef, fried lemon grass but doesn’t require the shrimp sauce like the Hue-version. Only heard the name that you will what you are up to. You have to like chili very much to taste this dish. The dish, although simple and bucolic, doesn’t easy to cook and requires some expert techniques to pull it off. 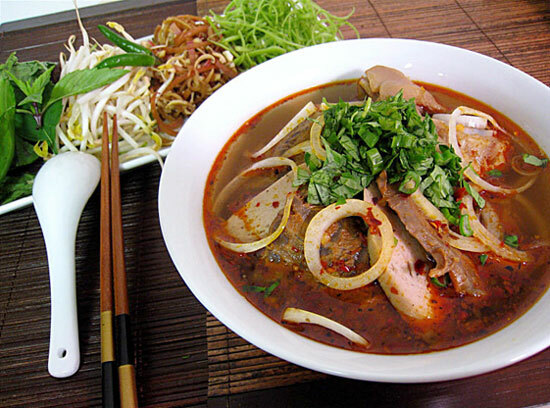 The smoky bowl of noodle, with the dark and thick broth, is served with basil, lemon, and a plate of chili salt. 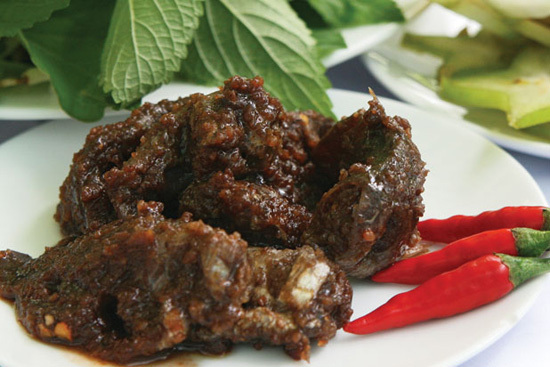 Eating the spicy beef for breakfast, you will definitely be rocked by the bold yet delicious flavors. Shrimp with coconut milk soup cake has the color white of the cake, the ivory of the broth, the red of shrimps, and the green of green onions, is just simply irresistible. The beautiful feature of the cuisine is the coconut milk. Fat and sweet, the coconut enhances the already strong flavor of the dish. Just a sip of the broth and you can feel everything from sweet, fat to salty. 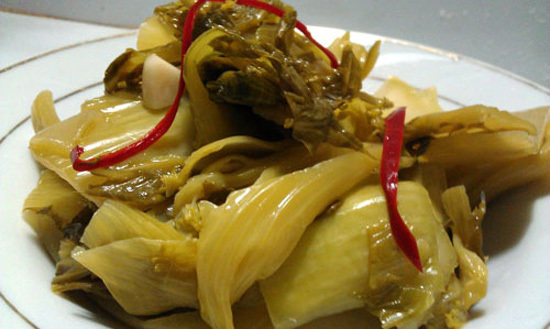 Bồn bồn pickle is now one of the most famous dishes in Bac Lieu. The Bồn bồn pickles can be deliciously served with rice and braised fish. The pickle is sweet and soft, and it also helps the fish from falling apart. The pickle is also perfect to braise with shrimp.